Microbial Source Tracking in Cottonwood Creek and Little Campbell Creek - This ADEC funded project is using microbial DNA in Bacteroides to identify the causes of bacterial pollution in these two urban streams. Matanuska-Susitna Stormwater Assessment - This project is the mapping of storm drains and outfalls in the Wasilla Creek, Cottonwood Creek, and Meadow Creek drainages and evaluating the effect of stormwater on water quality and the biotic communities. Biotic Water Quality Assessment: Fish Community Index - This project, funded by the Mat-Su Salmon Partnership, uses measures of the fish community to monitor changes in water quality and fish habitat. Wetland Water Chemistry - This project is funded by the U.S. Army Corp of Engineers and is designed to evaluate the influence of different types of land use and vegetation types on nutrient concentrations and other water chemistry parameters in wetlands of the Susitna River drainage. Little Susitna River Stream Condition Assessment - Project objectives include evaluation of hydrocarbon contamination and changes in turbidity due to motor boat use during the sport fishery. The project is funded through the State ACWA program. The project focuses on potential water quality and fish habitat impacts from residential development and recreational use. Evaluation of Juvenile Salmon Rearing Habitat - The objective of this project is to evaluate the relative importance of different stream types for rearing of juvenile salmon. Multiple stream physical, biotic, and chemical characteristics are compared between upland clear water streams and lowland wetland streams within the Susitna River Basin. 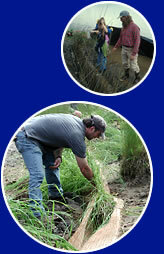 This project is funded by the ADFG through the Pacific Coast Salmon Recovery Fund. Hatcher Pass Water Quality Monitoring - This project funded by the MSB. The objective of this project is to obtain water quality data on the Little Susitna River prior to any future resort development. Evaluation of Fish Passage - This project is designed to evaluate adult and juvenile anadromous fish movement through culverts and other structures at road crossings of streams. Fish passage assessment is based on physical measures at the crossing location and the relative abundance of anadromous and resident fish. The project will evaluate fish passage at crossing structures both before and after reconstruction. This project is funded by the U.S. Fish and Wildlife Service, The Nature Conservancy and the ADFG Alaska Sustainable Salmon Fund. Fish Habitat Classification - Stream Water Temperatures. This project is funded through the Alaska Sustainable Salmon Fund and managed by the ADFG. The project is monitoring stream temperatures at approximately 30 locations throughout the Matanuska-Susitna Borough. Sites represent the diverse stream types found throughout the region. The project objective is to evaluate adult salmon returns relative to stream water temperatures during freshwater rearing.